This new immersive themed land in Disney’s Animal Kingdom will include two new rides, a restaurant and at least one gift shop. The area is based on the 2009 film “Avatar” by James Cameron. It will feature a storyline that takes place a few years after the events of the first film where Pandora has recovered from the war with humans and is now welcoming guests. Festive, colorful buildings reuse the ruins left over from the war. Guests are transported to Pandora by Alpha Centauri Expeditions, who is offering tours of the now peaceful planet. 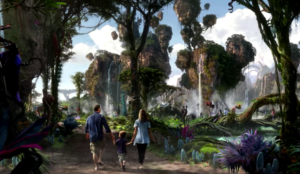 About the Rides: Flight of Passage will be a 3D simulator ride while the Na’Vi River Journey will be a more relaxing dark ride through the jungles of Pandora filled with bioluminescent plants and AA figures.